Her chain fell off so she calmly pulled up onto the sidewalk to fiddle it back into place. You can say "the chain fell off for me today..." and you mean that you were completely out of it and couldn't do anything right. If you want to give someone 'the back wheel', you really want to show them up/surpass them. In business, in sport, whatever. Meaning you'll zip past them and they'll see your back wheel. Copenhagen corner moments on Nytorv [New Square]. I think that is very interesting how the language of bicycling is a common reference point for Danish language in general. It's a shame for this girl and her oily fingers that properly tensioning your chain is not so ingrained in Danish culture. I was just admiring her stripy legs. What was everybody saying? Let me know if I can find it already! American bike culture lasted maybe 20 years and died about a century ago. Even our American Automobile Association is a spin off of the League of American Wheelmen (the national cyclists rights group, largely responsible for the first roadway pavings in America), founded by LAW members who abandoned bicycles when automobiles became readily available. Perhaps this century will mark the resurgence of recognition that the simple, elegant bicycle represents the paragon of man's individual transportation engineering achievements. "Ter boa pedalada" translates something like "to have good pedaling" and it's said about someone who can keep up a good pace. "Passar-se dos carretos" may be translated "skipping sprockets" and it means of someone who lost it. "Fica lá com a bicicleta!" translates "you can keep the bike!". It's used when you want to end a discussion that is leading to nowhere. Maybe it's because a bike is such a simple and cheap item. "Han cykler rundt i det" - He's biking all over it = He's messing up his presentation, he doesn't know what he's talking about. 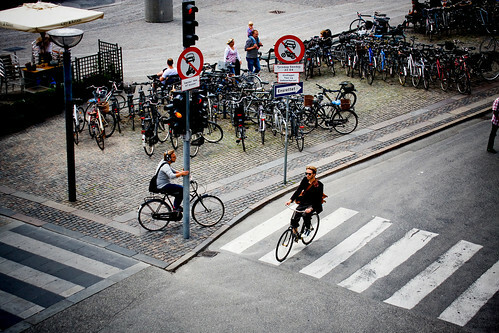 "At gå op på den høje klinge" - To shift into higher (bicycle) gear.